1 Marinate the chicken with lime juice and salt, let stand for 10 minutes, set aside. 2 Heat oil, saute ground spices until fragrant, add the sliced ​​lemongrass, stir well, remove from heat. For seasoning stir-fry 3 to 2, 1 part mixed with cassava leaves and lemon, mix well. The rest smear on the entire exterior of the chicken. 4 Enter the cassava leaves that had been peppered into the chicken cavity. 5. Wrap chicken with banana leaves. Heat the pan steamer, steam the chicken for 20 minutes, remove from heat. 6 Bake chicken that has been steamed until cooked, remove from heat. 7 Serve chicken with split ways with its contents. 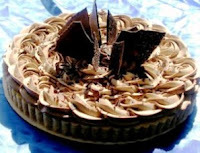 How to Make Chocolate Peanut Tart Most Easy – Tart is synonymous with a birthday cake. whereas cake can be made at any time for any event. So now we try to make nut chocolate cake recipe that can be practiced alone at home. 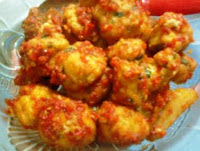 Actually this next picture is from google, as I can not make it as good as garnish cake .. haha ..
let’s make again processed out.